Books look at various aspects of the economic tsunami. A boom is coming. In fact, it has already begun. The rising tide of books dealing with ongoing economic catastrophe is building and will undoubtedly crest within the next couple of months. The blame games and finger pointing ought to be a hoot — or at least a cottage industry. This time, we'll look at four attempts to identify and elucidate the root causes of the mess, and in a few weeks, we'll examine several ''where do we go from here'' efforts. Panic. Michael Lewis. W.W. Norton & Co. 352 pages. 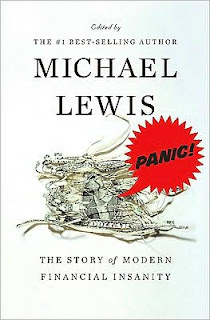 Lewis' compilation of articles and excerpts recounting the 20 years of mischief and malfeasance that preceded the current tsunami of crap (a/k/a ''The Great Recession'') is more fun than it ought to be. Not that it's a comedic yuk-fest, but the writing is quite sharp and a pleasure to read. The content includes contributions from Lewis himself (a master reporter and deft stylist), Dave Barry, Paul Krugman, Joseph Stiglitz and James Surowiecki, as well as contemporaneous reports from major newspapers. The text covers crises ranging from the Asian Meltdown, Russian Default and other more mundane — and unnamed — disasters right up to the current mess. House of Cards: A Tale of Hubris and Wretched Excess on Wall Street. William D. Cohan. Doubleday. 480 pages. 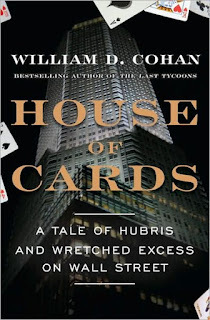 Cohan's previous book, on Lazard Fréres, was excellent, and this one is another exhaustive look inside a major financial institution, Bear Stearns. As with the earlier volume, the author does a superb job of revealing corporate culture and personalities. But this is far from a gossipy beach read. Cohan is a superb and incisive journalist, and his interviews and other research bring clarity and comprehensibility to this complicated and sordid tale. Catastrophe: The Story of Bernard L. Madoff, The Man Who Swindled the World. Deborah and Gerald Strober. Phoenix Books. 256 pages. While this is hardly a rush job or an instant effort, it was clearly composed rather quickly and will almost definitely be superseded by later books on Madoff, possibly by the Strobers themselves. Their narrative is straightforward and cleanly written; requisite pop psychoanalysis and telepathic reconstructions of events are kept to a minimum. Reportage and analysis herein emphasizes the human aspects of the Madoff scandal. The sense of shock and disgust is palpable as they proffer numerous quotes from victims, including Holocaust survivors, as well as depleted donors to charitable and educational institutions. Legal citations and other documents are quoted, too. 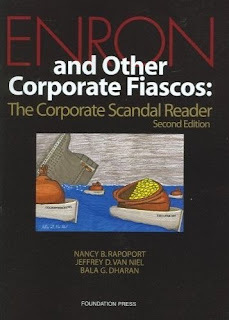 Enron and Other Corporate Fiascos: The Corporate Scandal Reader. Edited by Nancy B. Rapoport, Jeffrey D. Van Nie and Bala G. Dharan. Foundation Press. 1254 pages. If they ever decide to throw the book at Madoff or any of the other financial criminals, this 1,200-page-plus tome is the one I'd heave. This hefty volume — larger than many municipalities' phone directories — is a compendium of experts' writings on the Enron debacle and other malfeasance. Writers are mostly law professors, but there's one ringer — Malcolm Gladwell — whose New Yorker article on Enron is also available online, in case you want to skip this weighty compilation.